You are currently browsing the Recycling for Charities blog archives for May, 2010. It has taken some time, but the public has begun to realize how dangerous the e-waste epidemic is. Take a second to think about it. Technology is advancing every day with new electronics being released to replace the past ones, even if they are just a year or two old. The problem is that recycling efforts can’t keep up with the rate technology is evolving. When consumers get that new electronic, where does the old one go? More often that not it goes right in the trash, which will eventually make its way to the landfill. It was just recent that the e-waste problem started to grab the attention of government officials. Faced with the dilemma of solving this environmental issue, solutions had to be made to prevent this from further spreading. Manufacturers are now being held more responsible for their products as well. It’s a finger pointing issue where no one wants to accept the responsibility of solving the e-waste pollution situation. Luckily, there have been some changes in that attitude surfacing the past few months. Some states have set standards that manufactures have to abide by when it comes to recycling their old products. And surprisingly most manufacturers are complying; working with consumers to set up e-waste recycling programs. Even retail giants such as Target and Best Buy have set up recycling programs that accommodate e-waste. Private and public recyclers have begun adapting e-waste into their programs. 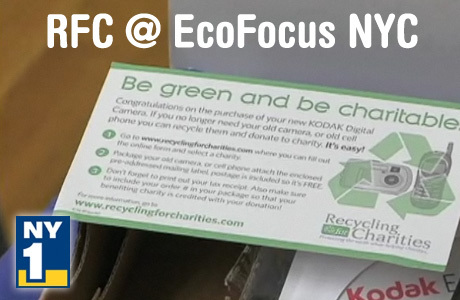 Non-profits such as Recycling for Charities have established programs to help fight e-waste. Municipalities are forming programs for their citizens to recycle their old electronics. The fight against e-waste is finally making some noise and if programs like these continue we and Mother Nature will be thankful in the future. For information on e-waste programs in your state check out E-Cycling Central. Also, our Recycling for Charities program helps fight the e-waste problem while supporting non-profits. If you have handheld electronics that need to be recycled you can donate the items to one of our affiliated charities. Here is coverage from the event provided by NY1. Make sure to check out the video! A new feature has made steel water bottles even more appealing, aside from reminding people how much better the bottles are for the environment than buying cases of plastic, disposable water bottles. One of the innovations on display at the recent EcoFocus green technology showcase is the $35 3-D Bottle. Added motivation to carry a reusable bottle. For added motivation to keep the lights off in your home, this is the Solatube Daylighting System…starting at $300 it pipes sunlight into rooms with few or now windows. down a reflective tubing and down into your interior space, where it’s diffused throughout your room,” says Teresa Benedetti of Solatube International. The Radio Thermostat Company of America helps consumers save energy with a WiFi component that is being built into several brands of thermostats. The component, which costs between $50 and $150, is then integrated into a home wireless network. Finally, older, outdated and even broken gadgets can be sent to Recycling For Charities, which finds a place for the used device, assigns a value to it and then donates that value to the charity of one’s choice. The organization says the devices will both be refurbished and resold or the parts will be sold off, but not a single piece of the donation will be placed in a landfill.